On this day Wednesday, September 14th, 2016 again held Praise and Divine Healing Service in cooperation with GKB, Pademangan, that is pastored by Rev. Yayuk. Pademangan is a region which is located in North Jakarta. The service was started at 7.00 PM opened in prayer by Rev. Yayuk from GKB Pademangan. 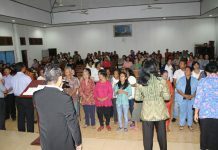 Then followed by praise and worship to God, where every congregation was invited to worship God with a grateful heart. Afterwards, aired a film of the healing testimony of Evi Silvia who was healed by the Lord from lung spots for 10 years. The congregations watched the film of healing testimony earnestly. Word of God was delivered by Rev. Yudi Sinambela from Matthew 15: 21-28 about a woman of Canaan who came to the Lord Jesus by faith. This Canaan woman believed that Jesus was able to perform miracles, so she came to God sincerely and humbly. The Lord Jesus looked at this woman’s faith. Thus the Lord Jesus wants us to come to Him by faith and believe that He can do miracles. When the servant of God invited the congregations to believe in God as Lord and Savior, then almost all congregations wanted to believe and invite the Lord Jesus into their hearts as their Lord and Savior. Later God’s servant invited the sick congregations to come forward to be prayed by God’s servants and counselors. That evening the Lord Jesus healed someone who had a-6-year cough, back pain, gout, and other diseases also cured by God. That evening the whole God’s servants and congregations rejoiced to see the Lord coming to visit, heal, and raise up His people. All who were present hoped that the Lord continued to work with the signs and miracles which accompanied all His people. Glory to the Lord Jesus!